Q : How did you meet? A : Through an online dating app called Coffee meets Bagel - who would have thought it worked! Sounds warm and fun! Q : Where was your first date? What did you do? How did it go? What were your feelings? How long was it? A : So I actually canceled our first date because I was sick but Sunny gave me another chance! We met up in New Brunswick, NJ (about 45 min outside of NYC) since we were both home visiting family. We went to a college dive bar (I think he was testing me) for a drink and then moved locations for some cocktails. Must have been going well enough to make it to the second bar. I personally couldn't read him that well but knew I'd see him again. Q: How long have you dated before your engagement? A : We dated for about 13 months before he popped the question! Q: How did Sunny proposed? I remember it to be at around Christmas time by the Rockefeller tree and lights? A: Yes! Sunny had been traveling for work and leisure for the first almost three weeks in Dec. So when he came back I booked him (to him I was forcing) to do an "all things Christmas in NYC". Little did I know he was planning with my good friend weeks prior his game plan for our special outing. We literally went everywhere around the city until we finally got to Rockefeller Center in front of the tree. We reminisced about our second date seeing the tree lighting and I'm pretty sure I said it couldn't get better than that. Next thing I know he's getting down on one knee and I have no idea what he said since I was in shock and too busy crying. After he proposed, he had our family and friends waiting at a nearby bar to celebrate! The best night ever! Q : What did you both love doing together and apart for the duration of your courtship? A: Apart Sunny loves playing volleyball and I love dance. Together we enjoyed some runs, a good day on the couch with movies and wine and always good food and drink that NYC has to offer us! Sunny always knows the best spots! Also him and I are probably the opposite of each other in most things. I stay up late, he goes to bed early. I like my junk food, he's a health nut. I'm a go with the flow person, and he's quite particular (in a good way), on vacation he wants to enjoy food and drink and I want to take him to every touristy place in each city...and that's just the start to that list. But it's a great balance and he's been amazing! And he thought it would be a great idea to take pictures in Paris! Lucky to have had a great photographer!!! 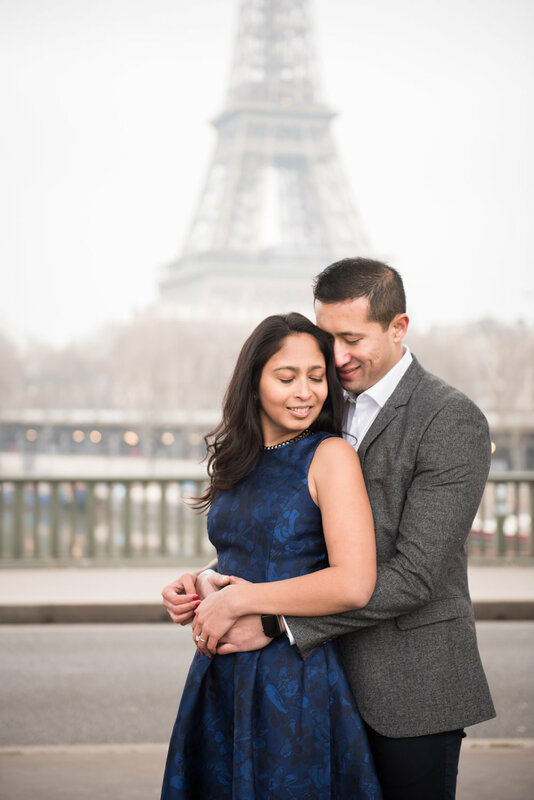 I hope this engagement photoshoot of Sunny and Kavita has given you a flavour of what your own Paris photo session could be like. If you'd like to enquire and know more, just click on the button below. I would be super delighted to hear from you.